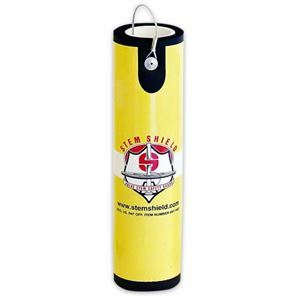 Stem Shields are pipe and elastomeric foam "sleeves" that quickly slip over exposed valve stems. A small, stainless steel tether holds them in place. They provide simple, cost-effective safeguards against preventable injuries and maintenance issues due to uncovered valve stems. Common Injuries associated with uncovered Valve Stems: Concussions, Scrapes, Cuts, Bruises, Facial Gouges, Broken Ribs, Dental Trauma, Dislocated Shoulders, Impalement. Common Maintenance/Miscellaneous issues that can occur are ceased up valves, Corroded stems, Debris in yoke, Lubricant dissipation, Tight Wheels, Torn FRC's.